Corrected Transcript and Commentary Copyright © 2009 - 2018 by W. David Woods, Kenneth D. MacTaggart and Frank O'Brien. All rights reserved. After finishing their work in the Lunar Module, Armstrong and Aldrin return to the Command Module and close the hatches. They put the spacecraft back into the Passive Thermal Control roll, then update their Flight Plan at Houston's request. As the crew settle down for the night, they spot a curious flashing object in the distance and discuss it with Mission Control. Apollo 11 continues its outward coast, leaves the Earth's sphere of gravitational dominance and passes into the Moon's domain. Astronaut Owen Garriot takes over at the CapCom console. 057:17:48 Collins: Houston, Apollo 11. 057:17:51 Garriot: 11, Houston. Go ahead. 057:17:55 Collins: Roger, Houston. I'd like to do a P52 option 3 and tweak the platform up prior to starting the PTC. Over. P52 is a computer program that Mike uses to realign the guidance platform. Option 3 means that he will align it per the current REFSMMAT and will do so by sighting on two stars. The REFSMMAT (Reference to a Stable Member Matrix) is simply a definition of an orientation in space. The current REFSMMAT that they are using is one that suits the setting up of their barbecue roll. 057:18:14 Garriot: 11, Houston. That sounds like a good idea to us. Go ahead. 057:18:20 Collins: Okay. And the platform's looking pretty good to me. It looks like the worst axis drift is 0.01 something degrees per hour. Is that about what you figure? 057:18:27 Garriot: 11, Roger. We've had reports all the marks have been good all the - the last couple of times you've run them. Just a moment; I'll get you some information on the apparent drift rate. 057:18:41 Collins: Okay, Owen. Thank you. You got the Maroons on? 057:18:47 Garriot: Say again, 11. 057:18:51 Collins: I say you got the Maroons on now? 057:18:54 Garriot: Not permanently, Mike. Just have a stand-by here while Charlie's out checking how to use that special tool on the camera. The Maroon Team will be on tomorrow. 057:19:06 Collins: Okay. Nice to hear your voice. How's everything going? 057:19:09 Garriot: Everything's going smoothly here. We sure enjoyed the show this afternoon, Mike. 057:19:27 Garriot: 11, Houston. We suggest you go ahead and do the P52 first, and we'll take a look at the angles and give you some new drift rates after taking a look at them. Over. 057:19:37 Collins: All right. Fair enough. Mike goes ahead with his P52, sighting on stars 31 (Arcturus, Alpha Boötis) and 35 (Rasalhague, Alpha Ophiuchi). 057:25:00 Garriot: Apollo 11, Houston. Over. 057:25:05 Armstrong: Go ahead. 11, here. 057:25:07 Garriot: 11, Houston. A little information to you there, CDR. We've all taken a momentary brief respite from our work here to have some special - have a bite of special moon cheese that is - I understand it's been sent to us directly from Wapakoneta, [Overheard in MCC: Wow! Congratulations.] your own hometown. Over. 057:25:31 Aldrin: We can't pronounce it either. 057:25:34 Armstrong: I think you'll enjoy that. They make a fine brand of cheese. 057:25:50 Collins: Houston, 11. You're looking at the Noun 93, and I'll proceed when you copy them. 057:26:00 Garriot: 11, Houston. We've got them. Having completed his star sightings, Mike continues through P52 to a point in the program where Noun 93 is presented on the DSKY's three registers. These three numbers represent the angles through which the three gimbals that support the platform need to be rotated (or torqued) in order to restore its proper orientation. While these numbers are on the DSKY, Mission Control can view them, thanks to telemetry. In this case, the angles are 0.111° in X, 0.128° in Y and 0.014° in Z. The star angle difference was 0.01°, this being the difference between two angles; the actual angle between the two stars and the same angle, but as measured by Mike's sightings. 057:28:15 Duke: Hello, Apollo 11, Houston. We'd like P00 and Accept. We have a Delta-H update for you. Over. 057:28:23 Collins: All right, Charlie. Stand by one. In the context of CSM operations, Delta-H refers to where on a planet's horizon Mike is taking his marks. One of Mike's tasks has been to carry out his own set of navigation sightings as they coast between two worlds. This is in case radio communication with Earth is lost. Mike's navigation uses P23 in the computer and the technique involves using the sextant to take angle measurements between a star and a planet's horizon. However, Earth's horizon is fuzzy, thanks to the atmosphere (and the Moon's is somewhat rough). Based on the P23 sightings he has already done on Earth's horizon and the state vectors that were derived from those, Mission Control can determine how far off the computer's mathematical model of Earth his sightings were. In other words, at what height in the atmosphere was he marking and how does that compare to where the computer thinks Earth's horizon is? 057:29:31 Collins: Houston, Apollo 11. P00 and Accept. 057:31:48 Duke: Apollo 11, Houston. We got the load in. The computer's yours. Over. 057:36:04 Duke: Hello, Apollo 11. Houston. We'd like you to stir up the cryos now. Over. 057:36:14 Collins: Houston, Apollo 11. Rog. The Service Module has four spherical tanks that cryogenically store the reactants for the fuel cells; two each for hydrogen and oxygen. The oxygen tanks also supply the breathing air for the crew. In order to pack sufficient quantity of these normally gaseous substances into the tanks, they are kept under both very high pressure and very cold temperature. This puts them into a supercritical state that is often described as being neither gas nor liquid, but rather a dense fog. The tanks are extremely well insulated but heat does slowly leak in. On one level, this is not a problem because heat is required to maintain the high pressure within a tank and keep its contents supercritical. However, a side effect of the heat leakage is that the contents near the walls become less dense as they warm up when compared to the contents at the centre. This has an effect on how a tank's quantity is measured. Each tank uses a capacitance probe that runs across its diameter in order to measure its reme. This consists of two conducting tubes, one inside the other. The tank contents act as a dielectric that affects how electrical charge is stored between those two tube, a property known as capacitance. For accuracy, the density of the contents needs to be constant so periodically, they have to be stirred. For this, each tank has two small fans installed that can be switched on to remove any stratification and homogenise the contents and this is what Mike is being asked to do. It is well known that the stirring of an oxygen tank on Apollo 13 led to the tank's catastrophic rupture and the aborting of that mission. Service Modules after Apollo 13 had an extra tanks for each reactant, partly to give more resiliency but mostly because those missions were extended and required more consumables. This is Apollo Control at 57 hours, 44 minutes. We've had no further reports from the crew to indicate whether or not Neil Armstrong and Buzz Aldrin have returned to the Command Module. 057:44:33 Armstrong: Houston, Apollo 11. We're completed in the LM. We're closing up the hatches and the probe and drogue back in. 057:44:42 Duke: Roger. We copy. Out. And I guess that would answer our question. Neil Armstrong reporting that they are finished with their work in the LM, will be coming out shortly. Apollo 11 is now 179,490 nautical miles [332,415 km] from Earth; traveling at a speed of 3,121 feet per second [951 m/s]. In a little less than 3 hours, we'll pass a milestone of sorts, as the spacecraft passes into the lunar sphere of influence. And what we mean by that, is that at that point, the spacecraft will be under the dominant influence of the Moon's gravity. The Moon's gravitational force will have the predominant effect on the trajectory of the spacecraft. And at that point, our displays in Mission Control monitoring velocity and altitude will switch from Earth-reference to Moon-reference. We'll then begin monitoring the progress of the spacecraft as it continues to accelerate toward the Moon. At 57 hours, 46 minutes; this is Apollo Control. 057:59:38 Duke: Hello, Apollo 11. Houston. We're standing by to watch your startup on the PTC at any time. You can start off with the Verb 49. Over. Verb 49 will command the computer to automatically maneuver the spacecraft to a desired attitude, in this case, the initial attitude for the PTC. 057:59:48 Armstrong: Wilco. We're just finishing up the probe and about to close up the hatch here. We're going to be a couple of minutes late, probably, getting started in the PTC. 057:59:59 Duke: Rog. No sweat, 11. We're standing by. Over. This is Apollo Control. That was Neil Armstrong reporting that they are now reinstalling the probe and drogue, which is just about on the Flight Plan schedule, and they reported that they would be putting the spacecraft in a slow roll shortly to maintain Passive Thermal Control. In that mode, the spacecraft rotates at a rate of about 3 revolutions per hour to maintain even heating. We have a precise time on that sphere-of-influence change, the point at which the Moon, for calculation purposes here in Mission Control, comes under the predominate influence - the spacecraft comes under the predominate influence of the Moon's gravitational field, and we now calculate that that event will occur at 61 hours, 39 minutes, 55 seconds Ground Elapsed Time. 058:06:08 Duke: Hello, Apollo 11. Houston. Mike, there's no wait required. Where rates are steady, you can proceed on. Over. 058:06:17 Collins: I'm doing it, Charlie. 058:06:24 Collins: The tunnel's all taken care of. The drogue, probe, and hatch all back in. 058:06:28 Duke: Roger. Copy. Out. 058:11:46 Armstrong: Okay, Houston. 11's ready to copy. 058:12:27 Armstrong: Okay. I have F/2-22. 058:13:01 Armstrong: Okay. I have in F/2-22, column Lima, item 6, 00001; item 7, 02134. 058:13:37 Duke: 11, Houston. For your information, those two entries are an update to your Delta-H that we are - have already uplinked into the CMC. Over. 058:14:04 Collins: What was I marking on, Charlie? About an 18-kilometer line, or what? 058:14:09 Duke: We - Our update puts you to - the Delta-H to 35 kilometers, Mike. Over. When Mike took his star/horizon angle measurements through the sextant, he strove to place the image of the star on what appeared to him to be the limb of Earth. These sightings would then yield a state vector. However, the fuzziness of the atmosphere makes that sighting somewhat ambiguous. By comparing Mike's state vector position with one they have derived from the ground, controllers could determine the degree to which Mike's preferred horizon is offset from the true, mathematically modelled horizon, and compensate for that in the computer. It does not matter that Mike is not marking on the true horizon. It only matters that his sightings are consistent, and can therefore be compensated for. 058:19:24 Duke: Hello, Apollo 11. Houston. We've got some switch positions for you for the High Gain. Over. 058:19:33 Aldrin: Okay. Go ahead. 058:19:35 Duke: Roger, Buzz. Select Bravo, Omni, High Gain Track to Manual; Beam, Wide. Over. 058:19:48 Aldrin: Okay. Bravo, Omni; Track, Manual; and Beam, Wide. 058:19:53 Duke: Roger. And your High Gain angles are minus 50 on the pitch, 270 on the yaw. Over. 058:20:03 Aldrin: Okay. Going there now. Based on image measurement and triangulation, a photograph of Earth is taken at about 058:30. AS11-36-5401 - Earth at about 336,000 km or 181,000 nautical miles. North is right. The Pacific Ocean dominates the view with the west coast of North America approaching the terminator. Image by LPI. 058:41:46 Armstrong: What - What are the updates going to apply to? As Neil keys his microphone, music can be heard playing in the background. The crew are relaxing as they have their meal. Landing site obliques are images of the landing site viewed, not from above as would be convention, but from the side, at an oblique angle. 058:42:36 Armstrong: Okay. Is any of those in the Flight Plan? The secondary radiator, for example? 058:42:43 Duke: That's affirmative. 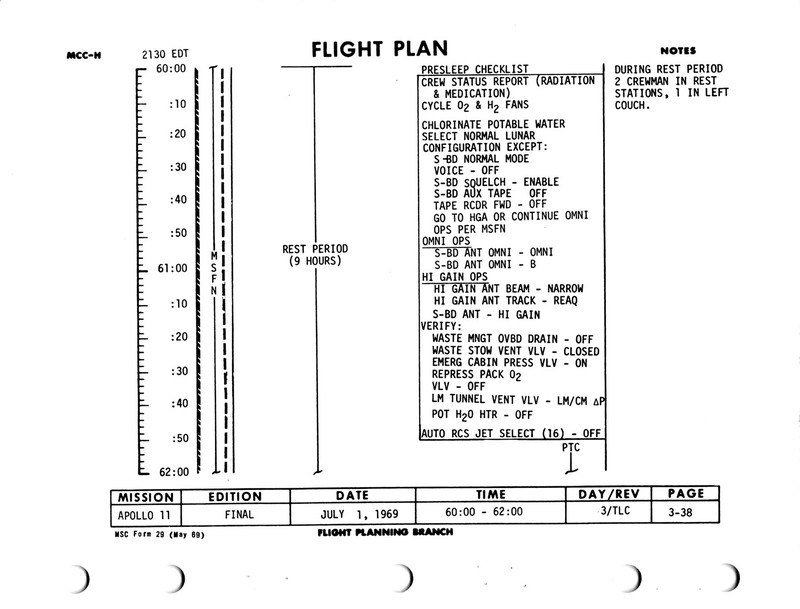 The secondary radiator leak check is called out in the Flight Plan at 71:20. That procedure is listed in your launch operations book on page 2-9, L2-9. We'd like to change that procedure. Over. 058:43:25 Collins: Charlie, on the secondary leak check, just read it verbatim like you want, and I'll copy directly into the Flight Plan and not fool around with the checklist. 058:43:32 Duke: Roger. That's fine. If you're ready to copy, stand by. 058:43:37 Collins: Ready to copy on the leak check. 058:43:40 Duke: Roger. It's monitor secondary accumulator quantity. Step 2 is secondary glycol to radiator valve, Normal for 30 seconds, then Bypass. If no decrease in secondary accumulator quantity - Are you with me? 058:44:21 Collins: Yeah, I'm with you. 058:45:52 Collins: Okay. I read back: monitor secondary accumulator quantity; secondary glycol radiator valve, Normal for 30 seconds, then to Bypass. If no decrease in secondary accumulator quantity, secondary glycol to radiator valve to Normal. Secondary coolant loop pump, AC-1 or 2. After 3 minutes, verify glycol secondary discharge pressure 39 to 51 psig. Verify secondary evaporator outlet temp has changed. Secondary coolant loop pump, Off. Secondary glycol radiator valve to Bypass. And what's the reason for the change, Charlie? 058:46:27 Duke: Roger. SPAN is concerned that our present procedure as shown in the checklist does not really flow glycol through the radiator, and it - They want to verify that we do not have a plugged secondary radiator. Over. SPAN is Spacecraft Analysis, a team of engineers outside the MOCR who stood by ready to work problems on the spacecraft and who constantly batted around what-if scenarios to try and catch problems before they developed. 058:46:48 Collins: Okay. They have any abnormal indications in that system, so far? 058:46:52 Duke: Negative. This is the procedure that they came up with. It's just a check, Mike. Everything's looking great to us. Over. 058:47:31 Armstrong: And Charlie, we'll get back with you on these other changes in a few minutes. Okay? 058:47:38 Duke: Roger, Neil. No hurry. Over. This is Apollo Control at 59 hours, 9 minutes. Apollo 11 now 182,000 nautical miles [337,000 km] from Earth, and the velocity down to 3,072 feet per second [936 m/s]. We've had very little conversation from the spacecraft in the past 40 minutes or so. 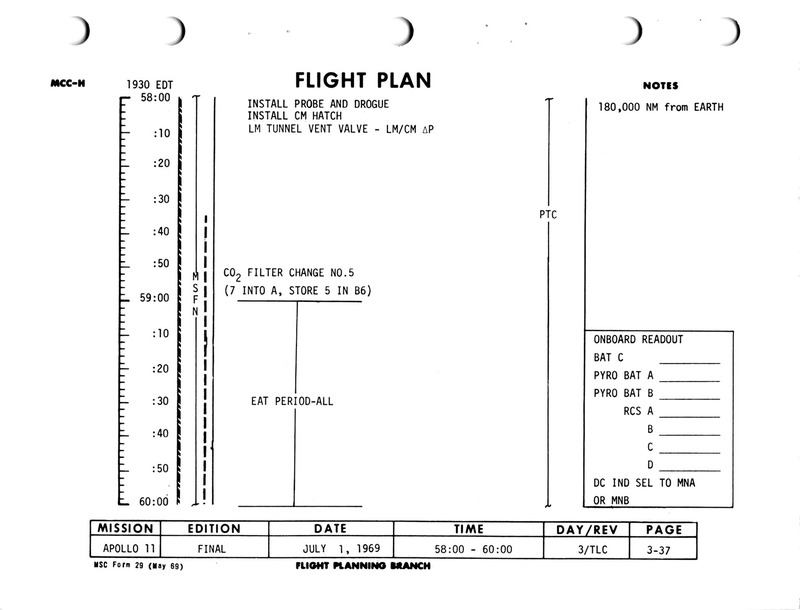 At this time, the Flight Plan calls for the crew to be getting ready to begin their eat period. That would be followed by a 9-hour rest period. We have one change to the Flight Plan to pass along. The television transmission which had been scheduled at 100 hours, 20 minutes to 100 hours, 50 minutes in the Flight Plan has been deleted. This transmission was to have occurred during the formation flying prior to the powered descent to the lunar surface. The decision to delete the TV transmission from the Flight Plan was made due to a lack of available satellite channels to relay the signal from the tracking site of Madrid to Houston for conversion. [Music] The intermittent music that we're getting is apparently coming from the spacecraft. The crew has onboard portable tape recorders with music on the tapes, and as they store their own comments on the tape, the music is, of course, erased, and apparently the music is triggering the VOX operated microphones and we're getting intermittent music down from the spacecraft. 059:11:09 Armstrong: Say again, Houston? 059:11:28 Duke: Rog. That was good. You can keep it coming down, 11. 059:12:34 Collins: Because it's a special occasion today, Houston. This is the third anniversary of Gemini 10. 059:12:42 Duke: Roger. Happy anniversary. 059:12:51 Collins: Thank you, sir. Light orchestral music plays on the downlink from the spacecraft. This is Apollo Control. That comment a moment ago about the tenth anniversary of - about the third anniversary of Gemini 10 came from Mike Collins, who, along with John Young, flew the Gemini 10 mission, July 18 through July 21, 1966. The brief bit of music that we got from the spacecraft was coming to us from a distance of 182,190 nautical miles [337,416 km]. 059:19:32 Aldrin: Houston, Apollo 11. Ready to copy your update. 059:20:38 Aldrin: I think I heard you Charlie, but I'm not sure that I understand. 059:20:45 Duke: Roger. According to our stowage list the - the landing site oblique should be in the transfer bag. In the - But in the backup set of data, the intermediate-scale oblique is in the CSM lunar landmark book, and the large-scale oblique is in the back of the LM lunar surface map book; and that's the reason we think that they might be not where you think they are. Over. 059:21:15 Aldrin: Okay. We've got three obliques. The last one is one I asked for recently. It's just a blow-up of the second one. The first one is one that's got dotted lines on it, indicating horizon view and 50-degree LPD; and all three of those are in the transfer book. Over. 059:23:05 Aldrin: Okay. I got it. 059:23:07 Duke: Rog, Buzz. Under the DPS column on the pressure side, you go down to the fourth item, says pressure greater than 150 PTCA should be greater than 65 percent. Over. 059:23:28 Aldrin: Okay. That's greater than 1.8 for less than 65 and greater than 150 for greater than 65. 059:23:35 Duke: That's affirmative. Out. 059:24:32 Aldrin: Okay. I've got the mission rules No-Go. 059:25:20 Aldrin: Okay. I've got that: AC bus A for DOI and both buses NO-GO for PDI on. 059:25:56 Aldrin: Roger. Got it. 059:26:38 Aldrin: Okay. We're stopping that at 5 minutes to low gate. 059:26:41 Duke: That's affirm. That completes that card. The rest of the updates are just really for your information based on our 58-hour platform - look at the platform. We're [in] really good shape. Your gyros have almost no drift in them since - prior to the update, we were looking at X of a minus 2.24 MERU, Y of point - plus 0.87, Z of minus 0.11. Since the update, which was based on the 52-hour P52, I believe, we gave you an X drift of plus 0.79, yaw of plus 1.06, Z of plus 0.02 MERU. The difference between the 52-hour and the 57-hour alignments were - did not really give us enough time to get a real good or completely valid update on the drift check. So we're real satisfied with the way the gyros are looking. The PIPAs are looking great also. We are in real good shape with those, too. Over. Charlie Duke is quoting the drift rates in a rotational unit of measurement called the MERU. Invented by the Draper Instrumentation Labs at MIT, the people who designed Apollo's guidance system, it stood for 'milli-Earth rotational unit' or 'milli-Earth rate unit' and represented one thousandth of the rate at which Earth rotates. This is about 0.015 degrees per hour. Mission Control keep a close watch on the performance of the IMU and especially the rate at which the platform's orientation drifts. They also watch the PIPAs, Pulse Integrating Pendulous Accelerometers that sense changes in velocity, looking for biases in their measurements. 059:32:21 Armstrong: Houston, Apollo 11. Radio check. 059:32:23 Duke: Roger. Reading you five-by. How me? Over. 059:32:28 Armstrong: Okay. Loud and clear. You cut out when you were talking about the platform, at something about 52 hours, and after that, we never heard you again. 059:32:37 Duke: Roger. I guess we were changing antennas. Stand by. That's affirmative, 11. We were swapping antennas on you down here. Basically the word is we got a real good platform, very small drift on the gyros, and very small drift in the PIPAs. Over. 059:33:00 Armstrong: Roger. Thank you. And I'd like to have a few words of clarification, if you'll give them to me, on the RCS rule. What that change of pitch may mean. 059:33:14 Duke: Copy. A few words of clarification on the RCS? Oh, Roger. The - the update there, Neil, you are speaking of about the one axis down to 5 minutes of low gate? 059:33:31 Armstrong: Yeah. That's right. I'm not quite sure what that means - rule means, beyond 5 minutes. 059:33:38 Duke: Stand by. I'll make sure I got my story straight with Control. Stand by. 059:35:13 Armstrong: Roger. I think I understand. 059:35:45 Aldrin: Charlie, did you say you had some updates for me from the lunar surface book? 059:35:49 Duke: Apollo 11, say again. You were cut out. Over. 059:35:55 Aldrin: Roger. Did you say you had some updates for us in the lunar surface book. Over. 059:36:00 Duke: Negative. At this time, we do not have any updates for the lunar surface book. We wanted you to have it just in case. Over. 059:36:12 Aldrin: Rog. You were cut out that time. 059:37:09 Duke: Apollo 11, Houston. We swapped antennas on you again. I say again that we do not have any lunar surface update - book updates at this time. We're considering a few minor ones, but we're still kicking them around the MOCR. Over. 059:37:27 Aldrin: Apollo 11. Uunderstand. 059:45:31 Armstrong: Houston, 11. We have a crew status report for you. 059:45:34 Duke: Roger. Go ahead, 11. 059:45:39 Armstrong: Okay. Radiation: CDR, 11009; CMP, 10010; LMP, 09011. No medication. 059:45:55 Duke: Roger, 11. We copy for the radiations. And, we're considering - This PTC looks sort of weird to us, so we're considering stopping and starting over again, and we'll be with you in a couple of minutes. Over. 059:49:43 Duke: Hello, Apollo 11. Houston. Over. 059:49:48 Armstrong: Go ahead. 11 here. 059:49:50 Duke: Rog. We switched antennas on you, there, moment ago, Neil. Would you please give us a LM/CM Delta-P reading? Over. 059:50:00 Collins: It's less than 0.1. 059:50:13 Collins: 0.15, now, Neil says, Charlie. 059:50:16 Duke: Roger. Thank you, Mike. Could you give us some help? This PTC is strange: it's not like anything we've seen before and we were wondering if y'all have had any vents or any idea that could help us out. Over. 059:50:35 Collins: I didn't understand that. Say again. 059:51:09 Collins: Negative, Charlie. We don't know of anything. 059:51:13 Collins: Unless it's got something to do with that entry from - start from the position that we want to be in. I don't know. 059:51:21 Duke: Roger. When we started off, it looked real fine to us. Now it's drifting off with a funny pattern that we haven't seen previously on a flight. And we're just trying to figure out - I think we'll probably start it over again. We'll be with you momentarily. Over. 059:55:12 Duke: Apollo 11, Houston. We hate to say it, but we'd like to terminate this PTC and start over again. We have no assurance that we're going to get it through the sleep period with this funny configuration, or funny pattern. We'd like you to stop it now and then go back to pitch 090, yaw 0, and roll - whatever you stop on. Over. This is Apollo Control at 59 hours, 57 minutes. A few moments ago you heard CapCom Charlie Duke advise the crew to terminate the Passive Thermal Control mode that they are presently in and re-establish the three-revolution-per-hour roll rate about the spacecraft longitudinal axis that is used for thermal control. We had noticed a unexplained deviation from the attitude that the spacecraft was set up in. In this roll mode, ideally it would roll about the longitudinal axis with very little wobble and if wobble is introduced for one reason or another, the Reaction Control System jets would come on as soon as the motion out of the prescribed plane had occurred and gone beyond prescribed limits, in this case 30 degrees to correct. The jet firings on past missions do tend to disturb the crew's sleep. Rather than have the Reaction Control System jets come on during the night and perhaps have to awaken the crew to re-establish the Passive Thermal Control mode at that time, we elected to correct it now. Enabling only adjacent quads ensures that jet firings are uncoupled - that only a single thruster is used to bring them to the starting attitude. The very small impulses should mean that there will be finer control of the attitude and it will be less likely to overshoot the deadband. This is Apollo Control. We're getting quite a bit of noise on the air to ground circuit at this time as the spacecraft rotates from one omni antenna around to the next and we momentarily lose lock-on. At this time, Apollo 11 is 183,544 nautical miles [339,923 km] from Earth and the velocity, holding fairly constant now, at about 3,042 feet per second [927 m/s]. It's been moving down towards 3,000 feet per second [914 m/s] and seems to be leveling off somewhat. This is Apollo Control. We're going to take the air to ground circuit down temporarily until a stronger antenna lock is... Here's a call to the crew. We'll stand by for that. 060:03:40 Duke: Apollo 11, Houston. Over. This is Apollo Control. We will take down the air to ground circuit down at this time until we have re-established sufficient signal strength to eliminate the noise on the circuit. 060:05:55 Duke: Apollo 11, Houston. Do you read? Over. This is Apollo Control at 60 hours, 10 minutes. We've re-established good antenna lock-on this time, and we'll continue to monitor for any conversation from the spacecraft. The crew is presently re-establishing the Passive Thermal Control rotation rate of 3 revolutions per hour. Following that we expect they will begin their rest period. At the present time Apollo 11 is 183,821 nautical miles [340,437 km] from Earth. And the velocity; 3,037 feet per second [926 m/s]. 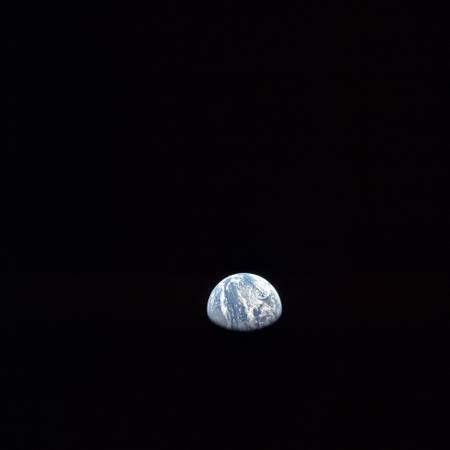 060:11:32 Armstrong: [Garble] Apollo 11. Go ahead. 060:11:35 Duke: Rog. Reading you about one-by. Looks like we picked a super attitude here for PTC stabilization. We're reading, you in Backup Voice now. Over. 060:11:51 Armstrong: Roger. We read you loud and clear. 060:12:03 Aldrin: Would you like us to pick another antenna? 060:12:06 Duke: I think we've got about the best configuration. We've been doing it all from the ground here, 11. We'll just keep it as it is. Over. 060:14:32 Duke: Apollo 11, Houston. Would you select Command Reset and Omni Alpha? Over. 060:15:03 Armstrong: Houston, 11 on Omni Alpha. 060:15:06 Duke: Roger. We're reading you about three-by now. Over. 060:17:19 Duke: Apollo 11, Houston. We is stable; you can start the PTC. Over. 060:20:59 Collins: Houston, Apollo 11. On checklist page F9-7; I've completed step 8, and I'd like to know what you think is ideal timing between step 8 and step 9 and step 10 on that page? Over. 060:21:15 Duke: Roger. Stand by. 060:22:46 Duke: Apollo 11, Houston. We don't see any time constraint. We'd like you to go ahead and set up the wide deadband then go through step 10 and 11. Over. 060:22:57 Collins: Okay. Will do. I don't see any constraint here, Charlie. I was just checking to make sure, because last time, I went from 8 to 9 to 10 to 11 a little bit more swiftly than I'd been doing in the past. 060:23:58 Collins: Step 11 complete. 060:24:22 Duke: Apollo 11, Houston. Would you please select Omni Bravo? Over. 060:24:43 Collins: Houston, Apollo 11. How are you reading on Bravo? 060:24:46 Duke: Roger. Reading you five-by. 060:25:07 Duke: Apollo 11, Houston. It looks like we've got a good PTC going. It's good night from the White Team. Over. 060:25:17 Collins: Okay. See you tomorrow. Thank you for everything. This is Apollo Control at 60 hours, 37 minutes. We said goodbye - goodnight to the crew about 10 minutes ago. We expect that they will be settling down for their rest period shortly. At the present time, Apollo 11 is 184,600 nautical miles [341,800 km] from Earth. The spacecraft velocity is presently 3,023 feet per second [921 m/s]. I understand there's been some interest in a comment made by Neil Armstrong during the television transmission about the EVA floodlight. Armstrong's remark was that the mast which the light is mounted on, appeared charred. He reported that the light works but had apparently - the mast that supported it had apparently been damaged during the launch phase. This light would be used in the event of a contingency EVA. It would have no function in a normal mission such as we are presently flying. And in the event that an extravehicular activity was necessary for transfer of the crew from the LM to the Command and Service Module, the light would be an aid in providing exterior lighting of the hand rails, but would repeat that it would have no function in a normal mission, and the charring which Armstrong reported is not considered significant at this time. We don't expect to have any further conversation with the crew. We will continue to record any - any remarks that we get and play those back. The Passive Thermal Control mode, which was re-established, appears to be functioning well at this time and all spacecraft systems are functioning normally. At 100 - rather, at 60 hours, 39 minutes; this is Apollo Control, Houston. 060:45:38 Armstrong: Houston, Apollo 11. 060:45:41 Duke: Go ahead, 11. Over. 060:45:46 Armstrong: Do you have any idea where the S-IVB is with respect to us? The crew have noticed an unexplained flashing object out of the window, which appears to be catching the sunlight as it tumbles. Neil is wondering whether it is the abandoned third stage of the Saturn launch vehicle. This is Apollo Control at 60 hours, 47 minutes. We just got a call from the spacecraft requesting that we give them the position of the S-IVB in respect to the spacecraft and we're currently coming up with that bit of information, so we'll stand by. 060:49:14 Armstrong: Okay. Thank you. The answer from Mission Control indicates that the mystery object is highly unlikley to be the S-IVB stage, given its great distance from Apollo 11. Although the object's identity was never resolved, it is quite possible that it is one of the SLA panels which covered the Lunar Module during launch. Aldrin, from 1969 Technical debrief: "Of course, we were seeing all sorts of little objects going by at the various dumps and then we happened to see this one brighter object going by. We couldn't think of anything else it could be other than the S-IVB. We looked at it through the monocular and it seemed to have a bit of an L shape to it." Armstrong, from 1969 Technical debrief: "Like an open suitcase." Aldrin, from 1969 Technical debrief: "We were in PTC at the time so each one of us had a chance to take a look at this and it certainly seemed to be within our vicinity and of a very sizeable dimension." Armstrong, from 1969 Technical debrief: "We should say that it was right at the limit of the resolution of the eye. It was very difficult to tell just what shape it was. And there was no way to tell the size without knowing the range or the range without knowing the size." Aldrin, from 1969 Technical debrief: "So then I got down in the LEB and started looking for it in the optics. We were grossly mislead because with the sextant off focus what we saw appeared to be a cylinder." Armstrong, from 1969 Technical debrief: "Or really two rings." Aldrin, from 1969 Technical debrief: "Yes." Armstrong, from 1969 Technical debrief: "Two rings. Two connected rings." Collins, from 1969 Technical debrief: "No, it looked like a hollow cylinder to me. It didn't look like two connected rings. You could see this thing tumbling and, when it came around end-on, you could look right down in its guts. It was a hollow cylinder. But then you could change the focus on the sextant and it would be replaced by this open-book shape. It was really weird." Aldrin, from 1969 Technical debrief: "I guess there's not too much more to say about it other than it wasn't a cylinder." Collins, from 1969 Technical debrief: "It was during the period when we thought it was a cylinder that we inquired about the S-IVB and we'd almost convinced ourselves that's what it had to be. But we don't have any more conclusions than that really. The fact that we didn't see it much past this one time period - we really don't have a conclusion as to what it might have been, how big it was, or how far away it was. It was something that wasn't part of the urine dump, we're pretty sure of that." 060:50:07 Collins: Houston, Apollo 11. How's the PTC looking? 060:50:32 Duke: 11, Houston. The PTC looks great to us. Over. 060:50:38 Collins: Okay, do you have any idea what happened to the previous one? 060:50:42 Duke: We have absolutely no idea. Over. 060:50:49 Collins: Okay. Did, it look like it was all right, then just all of a sudden start diverging? 060:50:57 Duke: That's negative, Mike. If you look at the plot, which we'll save for you and let you see it postflight, it's got - it started off immediately on the first rev and just spiraled out to about, oh, 20 to - 20 degrees in pitch, and then it seemed to be setting up a spiral around an offset pitch point of about 20 degrees off from 90 degrees; but we didn't want to take a chance that it would become stable at that point. We thought it might diverge, and so we called you and started over again. Over. 060:51:39 Collins: Okay, no complaints. I was just curious as to what had happened. This is Apollo Control at 61 hours, 39 minutes. We've had no further conversation with the crew since our last report. Flight Surgeon says there is no indication at this time that they have begun to sleep, but we expect they'll be getting to sleep here shortly. Coming up in less than 10 seconds now, we'll be crossing into the sphere of influence of the Moon. A computational changeover will be made here in Mission Control at this point, as the Moon's gravitational force becomes the dominant effect on the spacecraft trajectory, and our displays will shift from Earth-reference to Moon-reference. At that point, which occurred a few seconds ago, the spacecraft was at a distance of 186,437 nautical miles [345,281 km] from Earth, and 33,822 nautical miles [62,638 km] from the Moon. The velocity with respect to the Earth was 2,990 feet per second [911 m/s], and with respect to the Moon, about three thousand, seven... 3,272 feet per second. [PAO did mean to say 3,772 fps (1,150 m/s). These numbers were predicted by his colleague at 45 hours, 28 minutes GET.] The Passive Thermal Control mode that was set up for the second time by the crew appears to be holding well at this point, and all spacecraft systems are functioning normally. Mission going very smoothly. At 61 hours, 41 minutes; this is Apollo Control, Houston.